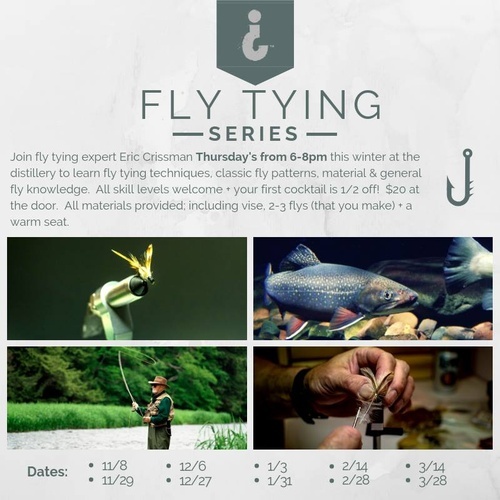 Join fly tying expert Eric Crissman Thursday's from 6-8pm this winter at the distillery to learn fly tying techniques, classic fly patterns, material & general fly knowledge. All skill levels welcome + your first cocktail is 1/2 off! $20 at the door. All materials provided; including vise, 2-3 flys (that you make) + a warm seat. Eric Crissman has been fly fishing Northern Michigan for over 25 years. Eric learned to fly fish in his early teens on the Pere Marquette River and has been tying flies since that time. Eric now lives in Elk Rapids where he mainly fishes the Au Sable, Manistee, Boardman, and Jordan Rivers. He has learned from some of the best anglers and tiers in Northern Michigan. He is extremely passionate about fly-fishing, fly tying, trout, and our rivers. Eric has a degree in fisheries management and works for the Michigan DNR Fisheries Division protecting and enhancing our world class fisheries. Eric has discovered a need in the fly fishing industry to teach individuals of all levels but mainly beginners different aspects of the sport. He is eager to share his knowledge of fly fishing, casting and tying to others and is a very patient instructor. This is a series of ten, two-hour classes hosted at the Ethanolo¿y Distillery in Elk Rapids, held twice each month on Thursday evenings from 6-8 beginning NOVEMBER 8th, 2018 at Ethanolo¿y. All materials, vises, and tools will be provided for students to use, however if you have your own vise and tools feel free to bring them to the class. Each session will cover two or more fly patterns, and the surrounding techniques an materials to tie them. You will learn the basic fly tying techniques necessary to tie wet and dry flies along with nymphs and streamers. The instructor will examine all of the different tools used in the tying process, including vises, lighting, and organization. The class will focus on the most effective Michigan fly patterns with instruction in the various skills and techniques in fly tying. You will learn and practice the elements of proportioning a fly with various materials, so that the finished fly looks and acts appropriately on the water. We will explore all of the materials that a standard fly shop would have in inventory, so that you are more familiar with how they are used, and materials will be familiar. The class will also expose very important tips and tricks that will make the fly-tying process exponentially more enjoyable. You will leave the class equipped with the fundamental skills needed to expand the craft. ***Eric will asses and discuss with students before each session, and based on the skill level and rate of return students he will determine what new techniques to introduce and or fly to learn. This will ensure that return students will learn new techniques, materials and flys each session.